Pieces of memory from "Santuario"
I stare into the darkness, seeing nothing but aware of everything. I know that I am not alone. The energy of the audience is dense. A wall, a force of love, strength, power, and compassion flows on either side of me. 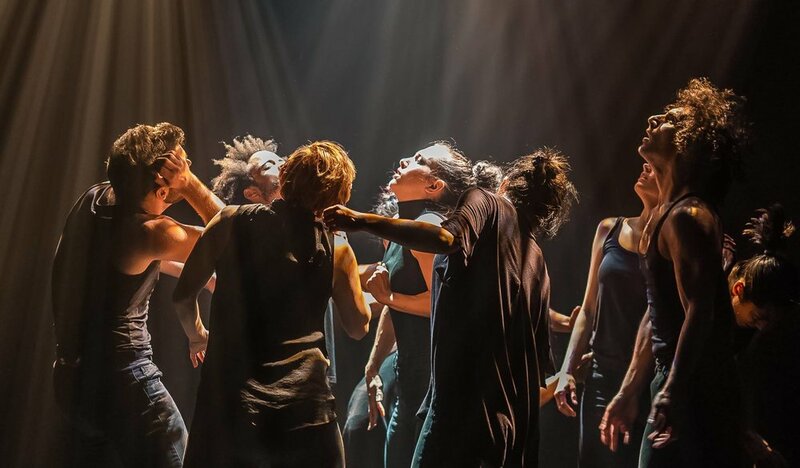 Without seeing or speaking, I step backward in unison with the other nine dancers on the stage as the curtain slowly lowers, slicing the thick atmosphere that has permeated the fourth wall. We dart to opposite sides of the stage. "I can lift you up..." blares over the speakers and the emotion that I've been channeling through my body springs from my eyes. Wiping the tears now smearing my makeup, I silently curse Kun-Yang for choosing such a dramatic shift between the end of the performance and the bow song, but like all choices Kun-Yang makes in his work, this is also clearly deliberate. I'm reminded of the many stories embedded in "Santuario" - the ones I know and have lived and the stories of people that I could never know. I'm reminded that in creating art, I have a responsibility not only to reveal the darkness, but through the work of making and sharing, "I can lift you up..."
We finished our final dress rehearsal before opening night. Sitting in a circle, we listened to a few final thoughts from Kun-Yang. Ken joined us and recounted some of his experiences at the Pulse memorial - the colors, the brightness against the heaviness, the challenge to create joy in spite of hate and terror. At the memorial were pins for visitors to carry away with them and the proposition to take a picture with the pin of the wearer doing something joyful - something that builds and creates in memory of those lost in a movement to celebrate life in the midst of mourning. Ken had brought a pin back for each of us. "I can lift you up..."
The pin lives in my makeup bag, so it's essentially with me whereever I go. Several weeks later, I still feel the heaviness of the performance and the joy of sharing and celebrating life through dance. I've been reflecting more on KYL/D's process during "Santuario" as the reality of the first anniversary of the Pulse tragedy and the birth of my own child add more information to my journey. I'm reminded of the challenge to find light in the darkness; joy in the sorrow; compassion in places of anger; and movement in moments when I'm frozen. Kun-Yang's choice of bow music - Capital Cities' "Safe and Sound" remains the soundtrack to my memories and the reminder of my call to use dance as a means of creating positive social change. "I can lift you up..."
Did you miss KYL/D's performance at Prince Theater? See it again at "American Dance Abroad: A Showcase Highlighting Philadelphia Dance" on July 27th at the Performance Garage!